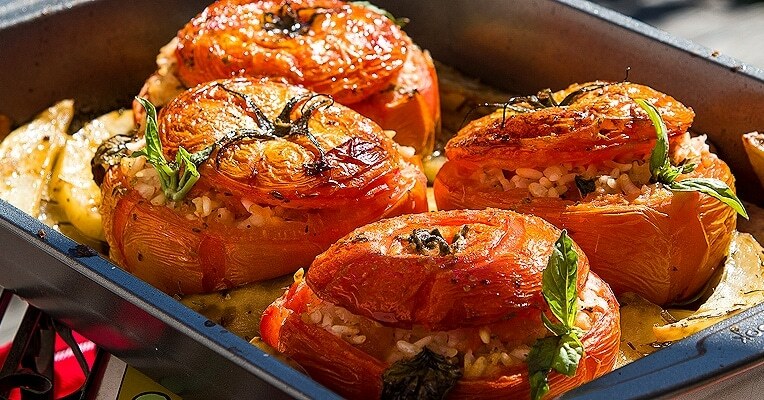 Summer is the perfect time to make rice stuffed tomatoes, a staple of picnics. Use fresh, locally grown tomatoes that are large enough to stuff but not enormous. You want them to be firm so that they’ll retain their shape and hold the stuffing, but make sure to use tomatoes that are fully ripe for the best flavor. Torn or burst stuffed tomatoes are still delicious, but not nearly as pretty! Serve warm or at room temperature. Creamy and filled with so much flavor, they are roasted in a pan with wedges of potatoes, which capture the excess juices when baked. Serve this as a light but hearty lunch (this pasta is perfect) or as a full dinner (I recommend chicken cacciatore, braciole recipe or this scaloppine dish) with the potatoes and a salad for a vegetarian night. Use the best tomatoes available, since they need to hold up to the long cooking time. One of my favorite light dishes when I was living in Italy were these risotto stuffed tomatoes, which I would buy every week from the local Rosticceria. Soak the rice in a medium saucepan of hot salted water for 2 minutes. Drain and set the rice aside. Cut the potatoes into wedges and set aside. Cut a 1/8-inch-thick slice off the top of each tomato and reserve the tomato tops. Scoop the pulp and juice from each tomato into a small bowl. Set aside. Sprinkle the inside of the tomatoes with salt and set them upside down on a clean surface. Oil the bottom of an 8x12-inch baking pan with 4 tablespoons of the olive oil. Place the potatoes and tomatoes cut side up in the pan. Toss the rice with the tomato juice and pulp. Add the Parmigiano-Reggiano, garlic, basil, parsley, remaining 2 tablespoons of olive oil, and salt and pepper, to taste. Combine well. Spoon the rice mixture into the cavity of the tomatoes, leaving 1/8 inch at the top. Sprinkle any leftover stuffing over the potatoes in the pan. Drizzle entire dish with olive oil, salt, and pepper. Place the tomato tops back on the tomatoes. Transfer to the oven and bake for 35-40 minutes.